Daniel “Rudy” Ruettiger shares the incredible true story of how he played football for Notre Dame despite dozens of rejections and how he got his story out to the world through the 1993 film Rudy. Most people know the story of Rudy, the small kid from Illinois who was determined to play football for Notre Dame despite having neither a strong academic nor athletic background. But not many know the story of how the iconic movie Rudy came to be made through the persistence of the man at its center. 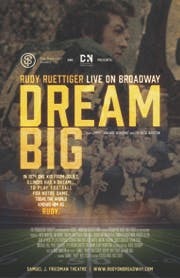 Daniel “Rudy” Ruettiger takes to a Broadway stage for the first time to share his incredible story.Hear in his own words how Rudy succeeded in getting into, and playing for Notre Dame, despite dozens of rejections. And hear how Rudy got his story out to the world, making him a household name synonymous with determination and refusal to quit. Audiences around the world were inspired by the most famous underdog movie of all time and a man they called Rudy. Join the real Daniel “Rudy” Ruettiger on Broadway, for Dream Big - an evening of poignant, humorous and inspirational true stories of how the world’s greatest underdog went from academic struggles in High School, to a stint in the Navy, a blue collar factory worker, a Notre Dame walk-on football player, and a graduate from one of the most prestigious universities in the country, to become the subject of the major motion picture Rudy, and ultimately one of the most inspirational speakers in the country.